I came across these lovely drawings and immediately thought how fun it would be to have the children create their own story to go along with these darling pictures. Then I thought, why not share with you lovely families. And then I thought, why not make it a contest! There are two different challenges to try your hand at. Each challenge is broken up by age groups (so a three year old won’t have to compete with a 16 year old!). Choose which challenge you’d like to join (or both! ), download your Challenge Pack for your age group and follow the instructions to enter. You’ll be emailing submissions to contest@littlelearninglovies.com. All submissions are due by Friday, April 29th! The first Challenge is the April Showers Writing Challenge. The second challenge is a drawing challenge. 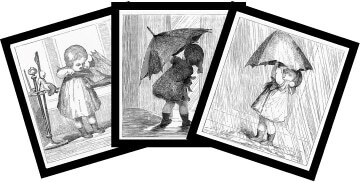 You will be adding a 7th image to the series to show what you think might possibly happen next to this little rain soaked girl. There is only one packet to download for all age groups. When you email me your submissions, please make sure you include the child’s age so I know what group to put the drawing in! I’m looking forward to seeing what you all send in! And please SHARE this contest! Tweet about it, post it on facebook, let others know by posting about it on your blog. The more entries, the more fun!! Did you pick a winner yet for the story? Is the contest closed, time got away an I forgot to post my daughter’s story. Can’t wait to show these to my daughter…she is quit the artist and I bet will love these two contests! have a great day! I’m looking forward to seeing her entries 🙂 Thanks for joining in the fun! Let me know how it goes! I wish you luck!